Zotac has been the recent master of the small-form factor motherboard. We've seen H67 boards rocking the mini-ITX style, with the top-end Intel Z68 and AMD A75 chipsets getting the same sort of treatment. These boards all had something in common (aside from the scale); a surprising amount of serious functionality in a frankly silly size. 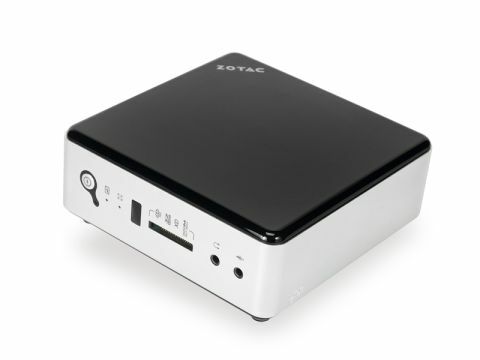 Now Zotac has turned its shrink ray on full devices and has created a PC with what has to be one of the smallest footprints ever. The Zbox Nano AD10 Plus is absolutely tiny. It's shorter than a Rubik's cube and smaller than a CD case. Ickle. But in there you've got a full PC. Well, so long as your idea of a 'full PC' means something sans optical drive and you have no interest in doing anything beyond multimedia playback and some light web browsing. The Zbox AD10 is a very basic machine, essentially with all the internal organs of a netbook, but without a screen. The archetypal 'nettop' then. But the nettop is largely becoming anachronistic in today's connected world. With more advanced media streamers hitting the market, capable of letting you browse the web and play online content, and TVs evolving with this functionality too, the low-powered mini PC doesn't really have a lot of tricks up its sleeve any more. Granted this AMD Fusion-powered version is more capable than its Intel Atom-based brethren, but still the gulf in performance between the low-end chips and the proper desktop options is huge. And that gap doesn't shrink much with Fusion in the equation. But if you're just talking about a small homework machine then the Zbox isn't a bad choice. That said a little netbook is going to give you more flexibility than something that has to be anchored to a desk and monitor full time. There's also the fact that the £255 price tag is more like £325 when you factor in a functional OS. A Microsoft Windows installation is really your only option here – we tried getting Ubuntu to play nice but it would take many long, tiring, frustrating hours and a lot of command line tapping to get anywhere near a responsive machine. When you're topping £300 you're straying into proper Windows 7 laptop prices. And if you're really interested in plugging it into your HDTV you'll be able to find one with a HDMI port I'm sure. In short there's depressingly little to recommend the Zbox AD10 beyond the fact that it is a very, very small PC. It's not even particularly easy to set up either as the lack of optical drive makes installing Windows a little problematic. Especially seeing as you can't have anything plugged into the two USB 3.0 ports of the four ports that are available until there are Windows drivers installed. And as we've mentioned, Ubuntu despite coming happily on a USB stick, doesn't particularly like the hardware inside. So as small as the Zbox undoubtedly is, functionally it's a little too late to the party. Your humble media streamer, and soon your TV, is going to be doing everything you'd realistically want this box to do. And will probably do it in a more intuitive way as well.